We have become accustomed to hearing about tragedies occurring on holidays. It usually involves drinking and driving; especially on those holidays when people travel the most to visit family and friends such as Christmas or Thanksgiving. This however, is the first time I have ever heard of such a horrible tragedy occurring in such a strange manner. Last Thursday a mother, father and their 2 children were boating on Suwannee River in Dixie County Florida when a large sturgeon jumped onto the boat striking 3 of them. The incident occurred as they were taking the boat out of the water at a boat ramp. The boy received a broken arm and the mother sustained injuries to her face, mostly around her eyes. 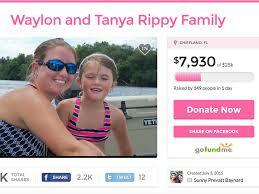 The daughter was airlifted along with her mother to Gainesville Hospital but unfortunately did not survive. Officials say that this is the first time that a fatality has occurred on the river as a result of being struck by a sturgeon. They also stated however that other persons have been injured this year by sturgeons in a similar manner. These fish are quite large (up to 8 feet in length and 200 pounds in weight) and are known to be able to leap more than 7 feet out of the water. Apparently, scientists do not know exactly why these fish jump out of the water but it is assumed that the lower water level of the river this year may be causing them to jump more often. Scientists also state that these types of incidents are accidents and not an intentional “attack” by the large fish. I decided to write this blog to make everyone aware of this strange situation and possibly help the family. Friends have established a fundraising page for the Rippy family on GoFundMe to help with the funeral and medical costs.